It seems that Apple made a poor decision when it set the defaults for Safari for Mac. 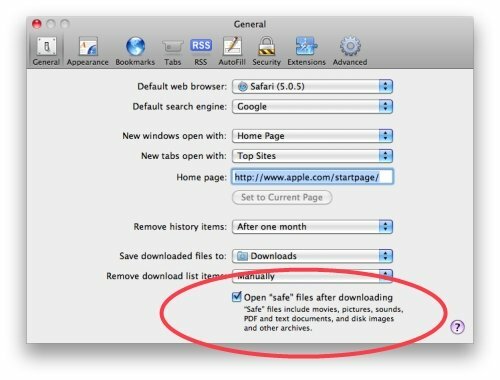 Safari currently allows certain supposedly safe files to be automatically downloaded and opened directly! This can therefore be very easily exploited by malware writers who want to push in malware and rogue software like MacDefender or its evolved cousin MacGuard. Interestingly Safari for Windows has “Always prompt before downloading” as its default settings, but Apple probably thought that this was not required for Safari on Mac; after all, a Mac was supposed to be safe and secure? Right!? Internet Explorer does not open files automatically, thereby protecting its user at all times. Mac users are therefore strongly advised to consider changing this default setting in Safari. To do so, simply make sure that “Open ‘safe’ files after downloading” is un-checked on your Macs. Just to be clear, making this settings change is no substitute for running anti-virus software on your Mac. But you knew that, right?, says Sophos. If you know of any Mac users you might want to pass on this information to them.